The Hata Yogi leaps barefoot from a table onto broken glass. Effect: Leaping on broken glass. Props: 50 to 100 kg of the bottom of soda water bottles or beer bottles. Roll them in a big sack to grind down the sharp edges and make the pieces smooth. A table. Method: The more glass there is, the safer it is to jump, because the force is absorbed by the heap of glass which is spread out to cushion your weight. First practise with shoes, then with socks, and finally barefooted. A magician or street performer walking barefooted across broken glass is a dramatic spectacle. If you have a close-up view, you can see the person's feet pressing against the jagged edges. Sometimes, you can even hear glass breaking underfoot. It's clearly dangerous, and some performers claim that it requires the utmost concentration or even mystical intervention. It's possible to fake a glass walk or to boost your chances of completing it without injury. Breakaway glass, also known as sugar or candy glass, is an easy-to-shatter substitute for real glass. When you see an actor break a bottle over someone's head, the bottle is usually made from candy glass. Broken edges can still be sharp, but the pieces aren't usually strong enough to pierce the sole of the foot. However, some types of candy glass can become sticky or powdery during the walk, ruining the illusion. You can also protect your feet instead of using fake glass. One option is to use an adhesive like spirit gum to hold a flexible sole to the bottom of your foot. Another is to use over-the-counter skin-toughening products to make your feet a little sturdier and less sensitive. Many glass walkers use broken wine or champagne bottles. Unlike broken bottle necks or drinking glasses, these pieces have a relatively gentle curve. You're not very likely to find a piece of glass with multiple sharp edges sticking straight up. The bed of glass is usually thick. When you step down, the pieces shift against each other, moving the edges away from your foot. Some people use a slightly padded surface under the glass, adding a little extra give. Glass walkers typically take slow steps, repositioning their feet if they feel very sharp points. This gives the glass lots of time to settle and adds an extra measure of protection against punctures. ­­­If you've ever stepped on a single piece of broken glass and hurt yourself, this might not sound like much protection. But the surface involved in a glass walk is not like your kitchen floor. In a glass walk, the weight of your body is spread out over lots of pieces, which have the freedom to move. When you step on a single sliver of glass, your weight is concentrated over that one sharp point. In addition, if you accidentally cut yourself on a piece of glass, the culprit is usually the movement of your skin along the sharp edge. 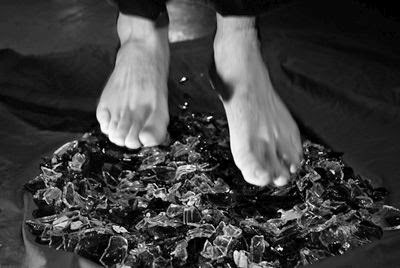 Walking on glass, on the other hand, requires you to put your feet straight down onto the edges, not to slide them around on the surface. Even though glass walking is possible, it's still a dangerous activity. Don't try it at home.